A little barn can keep your goats healthier and happier during times of cold or wet weather. A barn will also make it easier for you to milk your dairy goats, not to mention it will provide you a place to provide veterinary treatment in the event that a goat is injured. 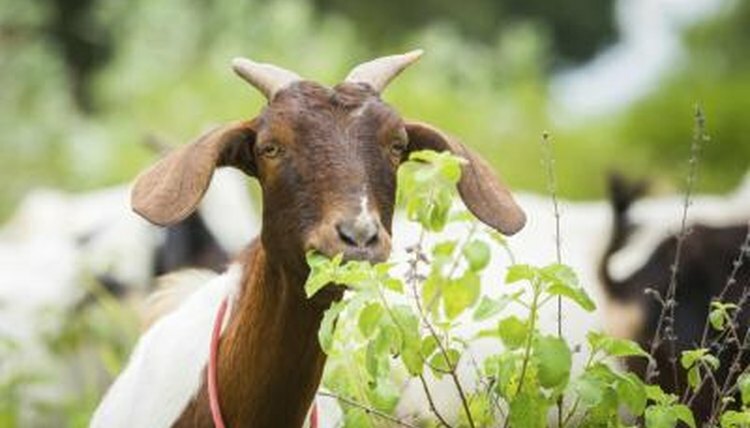 Goats do not need amenities inside their barns, but they do need some sort of solid shelter. Your goat barn needs to have solid walls and a roof that does not leak. It also needs to be built on high ground so it does not flood when it rains. You do not want your dairy goats standing in mud. The barn needs to be sturdy, or it can pose a hazard. If you do not have sufficient construction skills to build a sturdy, safe building, hire a contractor to build your barn. Your goats could be seriously injured or killed if you can not place your posts deep enough in the ground or secure the roof and walls on the structure correctly. Your small dairy goat barn can be as complex or simple as you want it to be. The most simple barn will have three sides and a roof, or four sides and an entry. The open side of a three-sided barn should face away from the direction that the wind is normally blowing in. Your barn can include stalls or not, goats typically do not mind being kept in an enclosed space together. The barn needs to be large enough for all your goats to fit into it with a reasonable amount of room. The size will vary depending on the size and number of your goats. If you are unsure of how much space your goats need, measure the largest goat's length and plan on him having at least a foot of space on all sides. He should be able to turn around and lay down easily within the barn, regardless of which way the goat is facing. The barn roof needs to be tall enough that the goat can stand comfortably under the roof without risk of hitting his head. Electricity, heaters, cooling fans and other features can be a nice addition to your homemade barn but are not necessities. Areas to tie, wash and milk your goats may be beneficial to you, along with secure storage areas for feed and hay. If you plan on breeding your goats, you may want to build a couple of large stalls to keep your mother goats and kids separate from the herd during birthing and when the kid is particularly young.